Editor’s Note: Yes, E&O prices have dropped; now here are a few tips on getting the most for your money. By now you have probably seen firsthand that prices for most home inspector errors and omissions insurance (E&O) programs are lower than they have been in many years due to the “softening” insurance market. With prices for fuel, food and practically everything else rising almost daily, it’s a much needed break- some inspectors are saving $1,000 or more on their annual policy. Minimum premiums for the lowest limit levels ($100,000/$300,000) are between $1,000 to $1,250, but as most of us understand, price is not the only factor to consider when shopping insurance. Price, coverage and service all matter. Yes, prices have dropped- now it’s time to learn how to shop. Coverage- What does the Base Policy Include? Is Referring Party coverage included? This provides coverage for real estate agents and is an important marketing tool to make you competitive. Most programs include it free. Does the policy surcharge for each additional inspector or is everyone covered for the advertised rate/minimum premium? If there is a surcharge, how is this determined- by revenue or per inspector? Are independent contractors covered? If so, is there a surcharge? This coverage can come in handy if you have overflow work or a job you need help with because you don’t yet have the competency. This may not seem relevant in slow times but markets can change, sometimes quickly. If your policy covers multiple inspectors without additional premium required, it allows you the freedom to assign work at any time, even one job, to a trusted independent contractor and know the coverage is in place. Or, if business dictates, it allows you to hire an inspector part or full-time without having to come out of pocket. If you do want to add an inspector or independent contractor mid-term, what is required? Is it as easy as notifying the agent by email or do you have to apply for new coverage and/or wait for an answer? In fact, how easy is the application process overall? Is it streamlined and fast or time-consuming and frustrating? How convenient is the quoting process? With OREP, most inspectors don’t require quoting. They can select their coverage choice from a self-rated application and submit in minutes. This gets you back to work fast! Are other coverages available and at what cost, such as WDO/WDI (wood destroying organisms/insects), radon, pool and new construction and/or commercial inspections? If you don’t offer additional services now and think this doesn’t matter, consider that certain coverages, such as for commercial inspections, may be good to have in case you get the opportunity during the year to expand your services- to learn and earn. This is especially true if there is no surcharge (or no surcharge up to a certain percentage of your total revenue). Competency is always required. Most programs include coverage for some commercial work up to a certain percentage of revenue. If the coverage is in place when opportunity knocks, you can answer the door rather than spending time scrambling for coverage and/or paying additional premium. What coverages are automatically included in the policies you are evaluating? There are other reasons for choosing a base policy that offers broad coverage, besides expanding your income. Consider the following scenario: you miss hidden termite damage during a routine inspection. You didn’t purchase WDI because you don’t do pest inspections. Does your base policy offer incidental coverage for this risk? If not, you may be on your own. Even though your scope of work is clear that you are responsible only for what is visible, and even though this is probably spelled out clearly in your contract, it does not prevent an irate homeowner from trying to make you pay anyway. If a claim is unjustified or frivolous, a professionally worded letter in language that opposing counsel can understand, prepared by a claims adjuster hired on your behalf by your insurance carrier, may be all it takes to convince the claimant that you did your job as per the signed agreement and you are not backing down. (To read an actual claim rebuttal letter, click “Claim Rebuttal Letter” on the homepage at OREP.org). Having your policy respond to such a scenario offers peace of mind even if you don’t do pest inspections. If you do pest inspections, does the E&O program you’re considering include this coverage? If not, how much additional is it? Is there a surcharge after a certain percentage of your revenue? Find out which coverages are included in the base policy you are considering and which you have to pay extra for: WDI (termite/pest), radon, commercial, pool/spa. When it comes to your E&O insurance, big price does not necessarily mean big coverage (and visa versa). Is General Liability coverage included? Both for when you’re at the job site and for bodily injury and property damage claims that arise out of your professional services as an inspector “after the fact.” These are claims, such as a child being injured after the family moves into the subject home due to a damaged staircase that you allegedly missed in your report, as well as premises coverage while you’re at the property- if you forget to turn the water off in the bathtub during an inspection and ruin the new floors. Ask your agent to explain the differences. If they are available, are the prices competitive? Prior Acts: In a previous story we discussed prior acts coverage and Claims Made policies in depth. 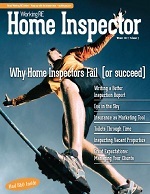 The vast majority of inspectors have Claims Made policies and most of the recognized home inspector programs provide prior acts free for qualified applicants. The key idea is simple: if you have insurance currently, you must renew on or before the expiration of the policy to ensure continuous coverage for past inspections. The same is true if you are switching insurance companies: do so before your policy expires and you should have no problems maintaining prior acts. For a complete discussion of Claims Made policies and prior acts, click the story “Inspector’s E&O Insurance: Market Softens- Prices Drop” on the home page at OREP.org. All things being equal, decide how you would like to be treated and where you want to spend your hard-earned money. The harder I work for my money (and the older I get), the more I seem to pay attention to where and how I spend it- this includes shopping for shoes or shopping for insurance. Does the agent want and appreciate your business? Does he or she seem to care that you receive the information you need to make the best decision for you even if it’s not their policy? Do they answer the phone and/or return calls promptly? Do they provide clear expectations about how the process works and how long quotes/documents will take? You deserve to be treated honestly, courteously and efficiently. If you’re successful in your business, chances are you’ve worked hard and understand the importance of customer service- your insurance agent should too. David Brauner is Senior Broker of OREP, providing E&O insurance for inspectors, appraisers and other real estate professionals (www.OREP.org) in 50 states. He can be contacted at info@orep.org or (888) 347-5273. Calif. Insurance Lic. #0C89873. Home Inspector E&O and GL Insurance – Get Quoted Today! services selected. Ask your OREP agent for details.